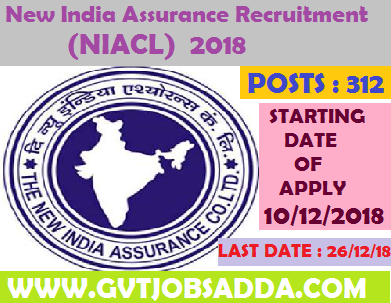 (NIACL) New India Assurance Recruitment 2018 Has Released employment notification for Administrative officers (AO) 312 Posts. Those candidates who are interested & eligibility they can apply online before last date of apply,The New India Assurance Company Ltd., a leading Public Sector General Insurance Company, invites applications for recruitment of 312 Officers (Generalist & Specialists) in Scale I cadre from open market. New India Assurance Recruitment 2018 .Brief information has given below. Selection Procedure New India Assurance Recruitment 2018 : Phase-I: Preliminary Examination & Interview. Salary Scale : Basic pay of Rs. 32,795/- in the scale of Rs. 32795-1610(14)-55335-1745(4)- 62315 and other admissible allowance as applicable. Total emoluments will be approximately Rs.51,000/- p.m.